Read over and over during my teens and the Old Testament for Western Civ in college. Whether or not you believe in it, this book has fabulous life lessons that can help us in our daily struggles. this anonymously written piece of fiction is a confusing assortment of extreme violence, waste, insanity, and ignorance. As a promotion of human sacrifice it can be looked at with mild interest as a window into a barbaric time of a small group of semi-nomadic monolaterally polytheistic arabs. If you are looking for truth there is none in this book, but it makes for a good comparison to other mythologies. not appropriate for children or the gullible. Best book ever written. It would have to be since it was God inspired, and it is a book about a King, God, the Kings Kingdom, and the Kings children, those that believe in Him, and Jesus the Christ, and live according to His word. A book to live by...enough said! Extremely beautifully and eloquently written. I personally think it is one of the best translation of the bible. 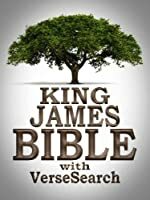 Whether you agree with it or not, the Bible (especially the KJV) is one of the most wide spread and influential works of literature in history. Ludicrous though some of it may be, it is doubtless forever ingrained in history, as the truth to paradise to some and as an enticement to genocide for others.